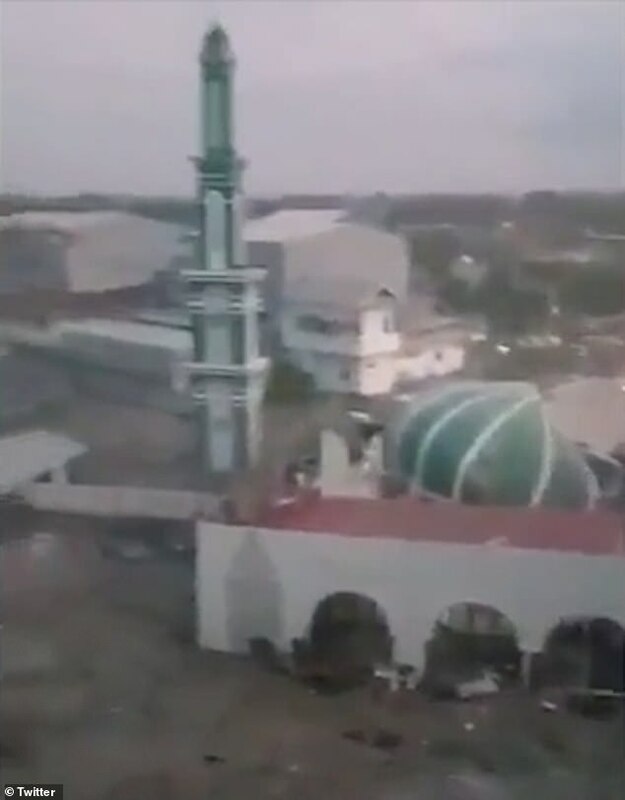 Horrific video footage has revealed the extensive damage caused by a tsunami that ripped through an Indonesian coastal city on Friday. 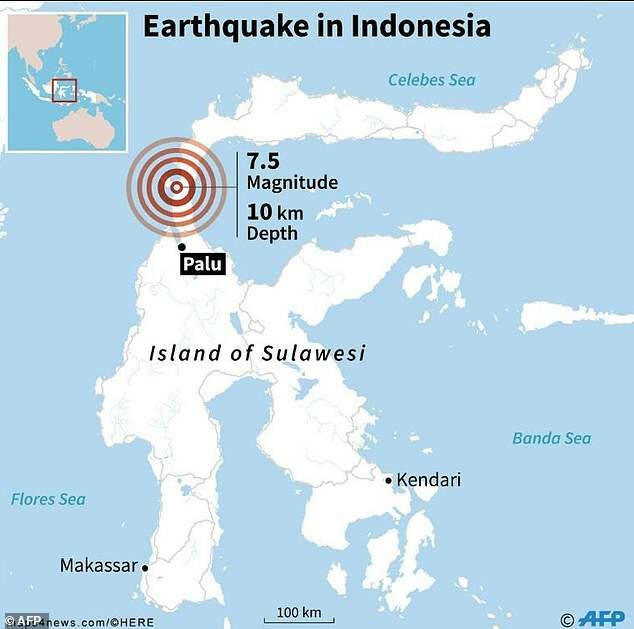 At least 384 people have been confirmed dead in Palu City, on the Indonesian island of Sulawesi with at least 540 also reported injured. Photos and video uploaded to social media by people caught up in the disaster reveal how the tourist town was hit by giant waves up to six metres (18 feet) high that destroyed thousands of buildings and homes. One clip showed how streets and buildings in the city were utterly devastated by the tsunami. 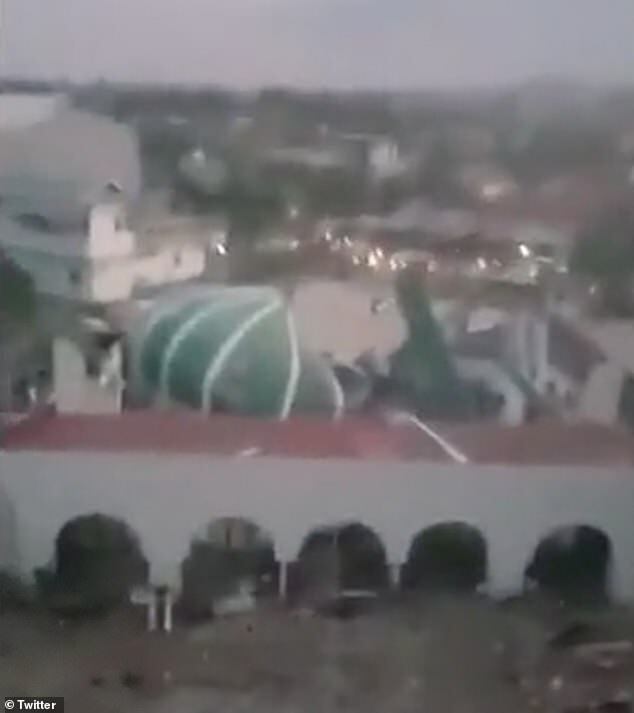 The dramatic video footage filmed from the top floor of a parking ramp spiral in Palu and posted on Twitter, showed a showed a wall of whitewater crashing into houses along the shoreline, scattering shipping containers and almost flattening a large mosque. People can be seen fleeing in panic as the tsunami devastates the surrounding area which, just moments before, had a car driving in it. 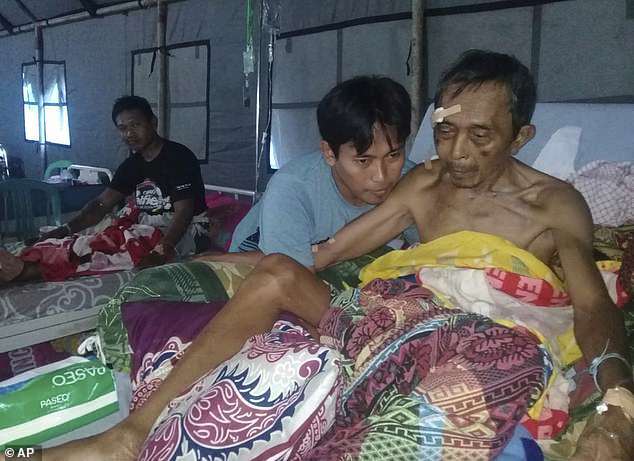 The impact of the disaster and the number of casualties is though to have been worsened by the fact that hundreds of people had descended on Palu’s beach for a festival to celebrate the city’s anniversary. ‘When the (tsunami) threat arose yesterday, people were still doing their activities on the beach and did not immediately run and they became victims,’ Sutopo Purwo Nugroho, spokesman of Indonesia’s disaster mitigation agency BNPB said in a news briefing in Jakarta. 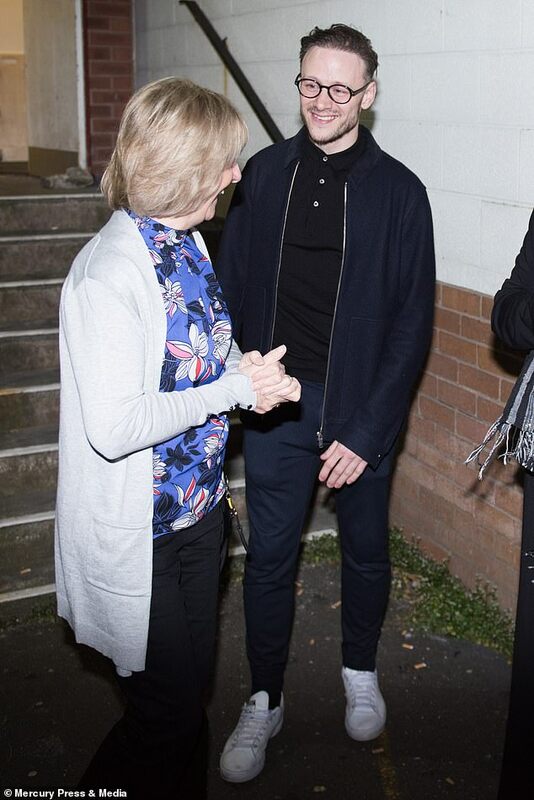 Other photographs from the city showed showed bodies being lined up along the street on Saturday, some in bags and some with their faces covered with clothes. 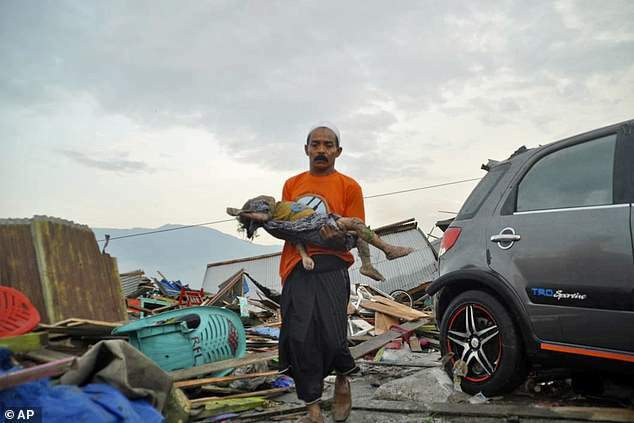 The extensive damage saw thousands of houses, hospitals, shopping malls and hotels destroyed, with a bridge washed away and the main highway to Palu cut due to a landslide. Bodies of some victims were found trapped under the rubble of collapsed buildings and injured people were being treated in makeshift medical tents set up outdoors, TV images showed. One clip even showed a baby being treated as the people grimly tried to deal with the aftermath of the disaster. Another showed the impact of the tsunami seen from the position of a fishing boat, with the fishermen heard praying as they take in the extent of the devastation. It’s clear that thousands of buildings have been damaged, with some entirely swept away or demolished, leaving scores of families missing among the debris.